Electric current doesn’t flow just anywhere. (If it did, you’d be getting shocked all the time.) Electrons flow only if you provide a closed conductive path, known as an electrical circuit, or simply a circuit, for them to move through, and initiate the flow with a battery or other source of electrical energy. Source of electrical energy: The source provides the voltage, or force, that nudges the electrons through the circuit. You may also hear the terms electrical source, power source, voltage source, and energy source used to describe a source of electrical energy. Load: The load is something that absorbs electrical energy in a circuit (for instance, a light bulb, a speaker, or a refrigerator). Think of the load as the destination for the electrical energy. 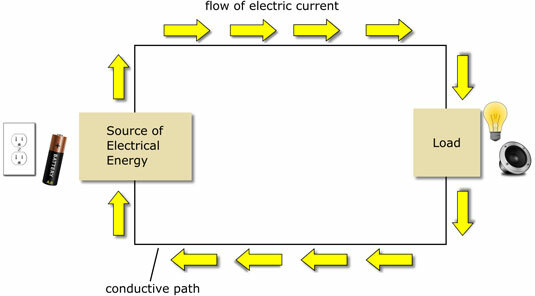 Path: A conductive path provides a conduit for electrons to flow between the source and the load. Copper and other conductors are commonly formed into wire to provide this path. A simple circuit consisting of a power source, a load, and a path for electric current. An electric current starts with a push from the source and flows through the wire path to the load, where electrical energy makes something happen (such as light being emitted) and then back to the other side of the source. Most often, other electronic parts are also connected throughout the circuit to control the flow of current. If you simply provide a conductive path in a closed loop that contains a power source but no light bulb, speaker, or other external load, you still have a circuit and current will flow. In this case, the role of the load is played by the resistance of the wire and the internal resistance of the battery, which transfer the electrical energy into heat energy. Without an external load to absorb some of the electrical energy, the heat energy can melt the insulation around a wire or cause an explosion or release of dangerous chemicals from a battery.